How long does an oboe reed last? The average consensus is 10 -15 hours of playing time or about 1 month, whichever comes first. 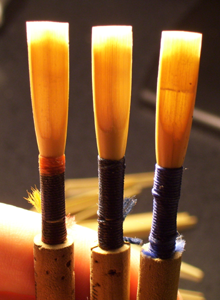 No two oboe reeds are exactly alike no matter what steps are taken to ensure they are as much the same as possible. Oboe reeds are made from cane (Arundo Donax specifically). Since it is a living thing, the cane will vary greatly. So what steps can you take to make sure your reeds are lasting as long as possible? 1. Never buy just one oboe reed. If you are out of reeds and restocking, never buy just one reed. If that one reed doesn’t play well, you are stuck with it until you can get more. Also (and more importantly) you can’t take the risk on having only one playable reed and it cracks or breaks in some way. 2. Purchase at least 3 oboe reeds at a time. See number 1 and number 3. It is really easy to play on the reed you love the most all the time and ignore your other reeds. Don’t fall into this trap! It will wear out sooner if you only play on one reed. Save the best reed for your lessons, really important band rehearsals, solos or performances. If you rotate the reeds when you purchase three at a time, they break in evenly and last longer. Play reed “A” Monday, reed “B” Tuesday, reed “C” Wednesday, then back to reed “A” for Thursday. Continue the pattern. Mass produced reeds purchased from most music stores have inferior scraping techniques and a shrill tone quality at best. You’ll have a more mature sound and enjoy playing on hand made reeds. 5. When soaking your reeds up to play, use water in a cup instead of trying to soak them in your mouth. Reeds soaked in your mouth don’t really feel as free blowing as reeds soaked in water. Saliva has digestive properties and degrades the reed as you play. Might as well keep the exposure to a minimum if possible. 6. Rinse your mouth with water (or brush your teeth) if you have just eaten before playing. Food “gunk” is no good for your reeds or your instrument! 7. Avoid oversoaking the reeds. If you have soaked up multiple reeds for the rehearsal or performance and decide on the reed you like be sure to put the others away. Leaving them soak for extended periods of time causes the fibers to lose their elasticity thus shortening the life of the reed. Out of oboe reeds? Try hand made reeds by Reed Pros! Visit http://www.reedpros.com and read the descriptions to see which reed is right for you. This entry was posted in Education and tagged Arts, double reed, music, oboe, Reeds. Bookmark the permalink.